Peeking through a notch near Utopia's false summit. 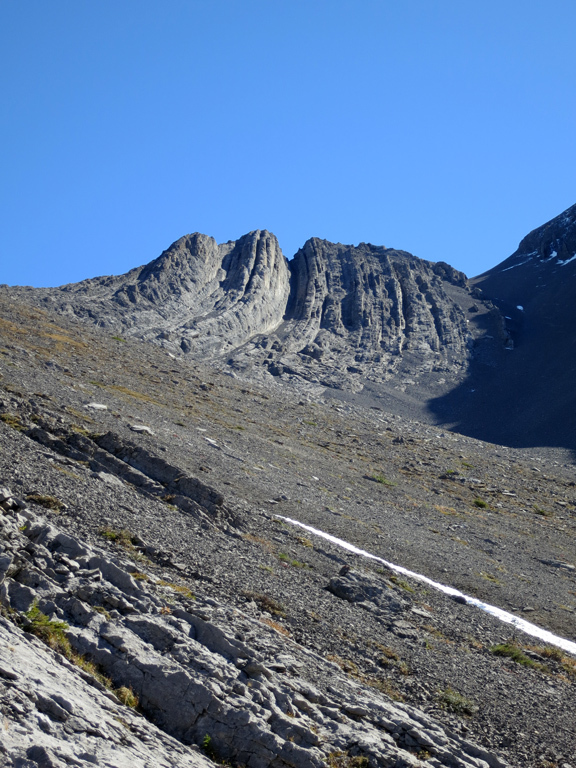 Located to the southwest of the Miette Hot Springs, Utopia Mountain is a moderately difficult scramble that offers excellent views, not only of Jasper's front ranges, but a veritable “sea of peaks” to its south as you approach the summit. 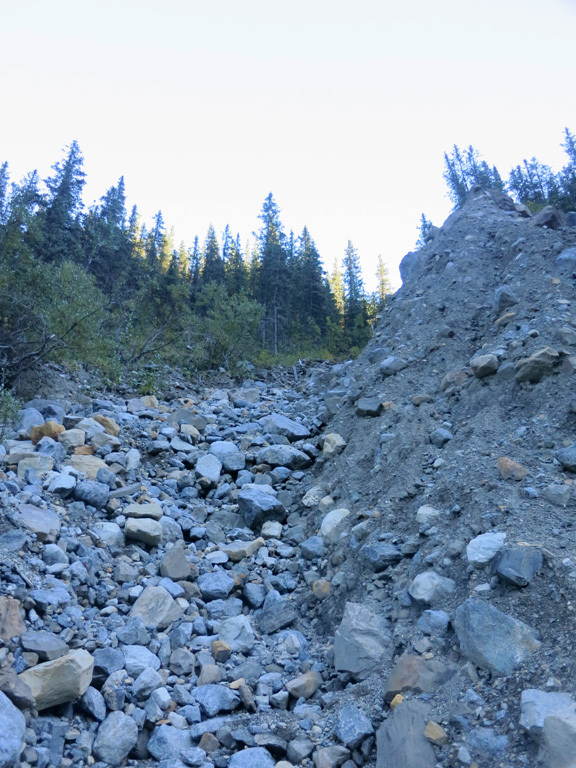 Requiring a significant amount of creek bed travel, this is a trip best saved for the late summer/early fall when water levels are at their lowest. For me, Utopia would be the first outing of an ambitious three-peak weekend that would see me summit three challenging “Kane” scrambles in Jasper National Park (including Nigel Peak and Hawk Mountain). Starting late and then encountering navigational difficulties twice, it would be one of those trips where a lot of things went wrong, yet somehow, it all worked out. The trailhead for Utopia Mountain is not only easy to find, but it's also a paved multi-use trail for most of the first kilometre. To get there take the Miette Road south from Highway 16 (Yellowhead Trail), not far from the Jasper's eastern park gates, all the way to the road's end at the Miette Hot Springs. Once you arrive to this sprawling parking area, keep heading to your southwest until the lot ends at a paved trail headed downhill into the valley. This trail will eventually lead you to the old hot spring pools (now an abandoned building), which you can detour around to left (east) to reach a well-maintained hiking trail (for the Sulphur Skyline) which continues south along the creek. At around the 1.3 km mark you will reach a footbridge that crosses the creek and leads the trail uphill through the forest. This is where you will leave the trail. For the next few kilometres you will be following fragments of trail along the southeasterly side of the creek as you follow it on its southwesterly course. What you'll be looking for is a trail heading up the ridge to the left shortly before you arrive at a large rocky drainage descending from the same ridge. I'd like to tell you more about that trail and how to identify it, but I missed it completely during my ascent and couldn't find it on the return either. The good news is that I found two alternative routes that work. If you arrive to this drainage on your ascent, you've gone too far. You can trudge straight up the drainage to reach the right area, but are probably better off taking a few minutes to backtrack in search for the trail, which should be nearby on a parallel course. After ascending for a period (roughly 20 minutes) you'll reach a large clearing before a major cliff band. As seen from above, you'll want to approach the cliff near the centre of the photograph (there should be cairn) and then look for an ascent route heading towards the skier's left/climber's right (west). The scrambling to the top of this ridge (which has two pitches with a bit of a shelf in the middle) isn't too difficult as long as you continue to head to the climber's right. If you start heading to the climber's left after the first pitch you'll run into a large number of smooth slabs that can be challenging to climb. Once you've gained the ridge you'll find yourself on the edge of a huge gully with the objective of reaching the shoulder of the first false summit, high to the climber's left. There are two route options for reaching that shoulder: the first is to follow the narrow rocky spine at the top of the ridge (the main crux of the ascent); the second is to bypass that section by taking a more direct, but much slower route up and across the scree slopes beneath that ridge to the climber's right (there are visible trails). As I knew I would be encountering challenging terrain on both Nigel Peak and Hawk Mountain that weekend, I decided to take the crux route for the ascent to make sure I was ready and to help me build up some confidence. The worst thing about the crux route is how it looks from the approach once you've gained the ridge. 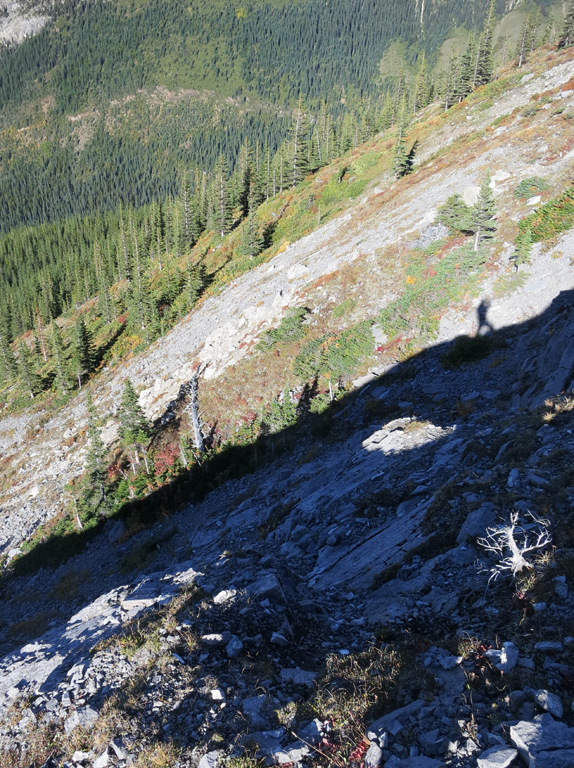 It looks incredibly narrow and steep; however, I found the scrambling to be much easier than I expected. There are good holds to be found, and the routefinding is fairly straight forward. That said, sections of the crux traverse are significantly exposed on both sides (but particularly to the west) and it can narrow to sidewalk width at points, so you still need to exercise a suitable level of care. I'd also suggest avoiding the crux completely if it's snow-covered, it's raining, or if the winds are particularly strong. Once you're past the crux, whether by traversing it or bypassing via the scree slopes, the route up to the first false summit is straight forward and easy; just follow the switch-backing trail. Any euphoria you feel upon reaching the crest of this slope will soon be tempered with the discovery a second false summit that requires ascending a boulder field with only faint bits of trail here and there. Once you've gained the second false summit you'll discover a cairn, a geological survey marker, and your first clear view of the narrow crux section which links with the true summit to the south. While the traverse itself is reasonably exposed, the challenge comes from a notch just before the summit itself. The notch requires a 2-3m downclimb to an area with significant exposure to the west. Similar to the first crux section, this looks worse than it is, and you'll soon find yourself scrambling the last few metres to the true summit its spectacular view to the south. Once you're ready to depart the summit, simply retrace your steps to the shoulder of the first false summit where I recommend bypass down as the treadmill scree makes for a fast and enjoyable descent. It's around here where you can decide to continue to follow your ascent route through the first cliff bands, or take an alternative descent route as described under considerations. 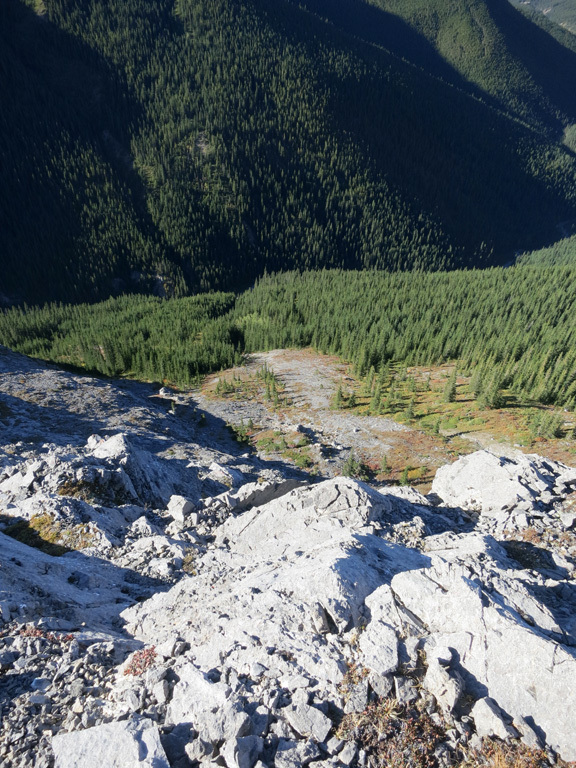 One of the things you may notice during the ascent of Utopia Mountain is that creekside trail doesn't stop at the point where you turn up to reach the first ridge. If you're a fan of waterfalls, you may wish to take an alternate route for your descent that will bring you back along that section of trail. Once you've reached the base of the first false summit (as seen in the top left of this photo), follow the easy scree bypass around the crux section and, instead of retracing your steps towards the ridge you ascended earlier, continue down the gully towards Mt. O'Hagan (as seen in this photo). You'll want to stay a little to the skier's right of the gully's centre as you near the bottom to avoid some cliffs. Continue downwards until you eventually reach the creek (which could require some light bushwhacking) and then simply follow it downstream. The trail's pretty easy to follow, but there is a steep section next to largest waterfall where you'll want to make use of nearby trees for support. Continuing downstream will soon bring you back to where you diverted earlier, and your return route towards the trailhead. 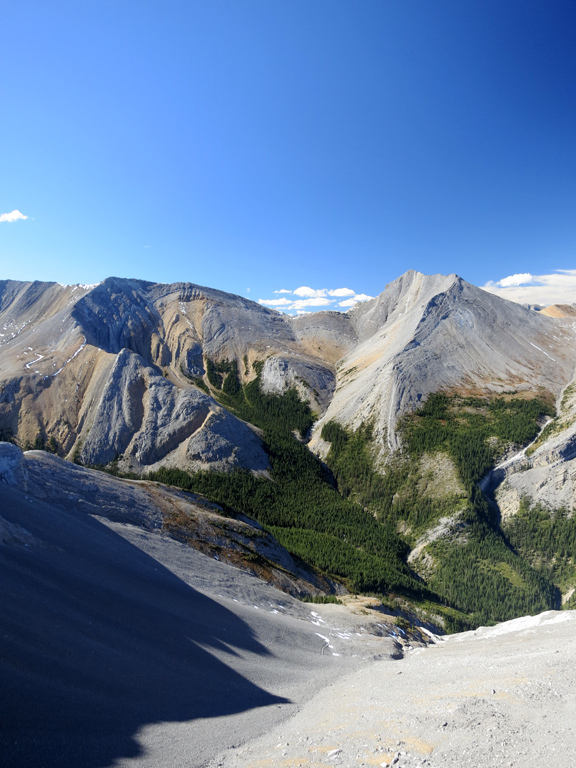 The ascent of Utopia Mountain is also described in detail in Alan Kane's Scrambles in the Canadian Rockies (pg.326). Note that Kane classifies this scramble as “difficult” due to the exposure risk encountered during the two crux sections (the first of which can be easily bypassed) mentioned above. You may also like to review trip reports from Bob Spirko or So Nakagawa for Utopia Mountain. 2,564 m / 8,412 ft.
1,364 m / 4,475 ft.
1,200 m / 3,937 ft.
353 m / 1,158 ft.
Maps without an available GPX file were drawn from memory, and should only be used as a REFERENCE.